Native Baha'i - Why are you Baha'i? I was recently asked why Native people are attracted to the Bahá’i Faith. The following are thoughts from my personal experience and are only an opinion. I thought some of you might find this interesting anyway. I think I can list a few of the most significant reasons. There are core beliefs of the Baha'i Faith that are either exactly like ours or take ours into a higher position of reality. For me, the Baha’i Faith is like an advanced degree in metaphysics. The mystical Writings are profound and life changing. They have enhanced my training in traditional medicines and ceremonies. But, that's just me. In general, here are few more things. Baha’is believe in progressive revelation which results in an acceptance of the world’s religions including Indigenous traditions. Religious history according to the Baha'i Faith is a series of time periods where Messengers of the Creator bring broader and more advanced teachings more suited for the time and place in which it is expressed. Unlike Christianity which was forced on Native peoples - most dramatically through Boarding schools - the Baha’i Faith states that there will be no force involved in accepting religion, that cultures and languages are to maintained and respected and incorporated within a Baha’i community. This community is to be like the flowers of a garden, diverse in color, shape, smell, etc. but co-existing in one garden. This is in direct opposition to the Christian Boarding schools whose motto was to “Kill the Indian and Save the man”. The Boarding school experience is one of the most traumatic events in Native history. The negative effectives of it still permeate our people’s consciousness and we struggle to heal from it. So, when the Baha’i Faith came along, many of us felt a tremendous sense of relief and the possibility for further healing. In fact two Native American Baha’is - Phil Lane and Phil Lucas - created films, documentaries and workshops based on the Baha’i Faith to help heal these wounds. The Baha’i Faith has also been a source of empowerment for Indigenous peoples since it requires no renunciation of preexisting beliefs, practice or identity, rather it has been a source of confirmation and connection reinforcing the validity of Native cultures and fostering pride in traditions, beliefs and culture. For instance: The National Spiritual Assembly of the Bahá’ís of Canada took a position of advocacy on behalf of First Nations Canadians in its formal submission to the Royal Commission on Aboriginal Peoples in the fall of 1993. The Baha’i Faith, even though it’s origins are in the Middle East is widely spread. Statistics from The World Christian Encyclopedia (2002) estimated there are 7.1 million Baha’is across the globe representing 218 countries. The majority of Baha’is live in Asia, Africa and Latin America. The largest Baha’i community is in India with around 2 million Baha’is. This is interesting to me since all these countries contain large, if not primarily, Indigenous peoples with ancient traditions and oral cultures. Another basic teaching of the Baha’i Faith, which I believe has attracted many Native people, is that religious truth is not absolute but relative, that Divine Revelation is a continuous and progressive process, that all the great religions of the world are divine in origin, that their basic principles are in complete harmony, that their aims and purposes are one and the same, that their teachings are but facets of one truth, that their functions are complementary, that they differ only in the nonessential aspects of their doctrines, and that their missions represent successive stages in the spiritual evolution of human society. And yet, another teaching of the Baha’i Faith I feel attracts many contemporary Native people is that science and religion are one and not at odds with each other. Many contemporary Native people are interested in defining ancient healing methods and ceremonies with the principles of science, especially physics. I have been reading a book titled “Blackfoot Physics” which, although written by a Euro-american scientist, is profound in it’s comparisons of traditional healing methods with physics. We also have a Facebook page called “Native Baha’is” and several of the discussions are on this topic. For instance, I posted recently that my nephew conducted a Sweat Lodge ceremony where he allowed a group of scientists to record and study the environment (atmosphere?) within the Lodge. Their finding was that the negative and positive ions switched dramatically from what we usually experience every day to an atmosphere that enabled the brain to function at a much higher capacity. Wikipedia also has a page on "Baha'i Faith and Native Americans". There’s a lot more to be said and I’ll add more later. If anyone wants to contact me about the Baha’i Faith you can send a message to me at: talismanart@gmail.com. In 1960, initially when I first heard the word "Baha'i", I dismissed it out of hand, without any knowledge of it, but later I did become open minded to it. I'll just say a few words about my own discoveries and maybe this will help answer some questions or help bring them into view. I often look past someone initially displaying no interest in "Baha'i" at first, since I did that originally. But I eventually discovered it was the one thing I had been searching for, my whole life. I am a Choctaw Indian and 69 years old. Our people are one of the so-called Five Civilized Tribes of the SE, along with Chickasaw, Creek (Muskogee), Seminole and Cherokee (Tsalagi). Our traditional Choctaw language (we actually spell Chahta) is a member of the Muskogean Language Family. I'm now an elder in my tribe and I'm very devoted to my Indian life, culture, identity and community. I live in Eugene, Oregon, and we have an extraordinarily large number of First Nations peoples living here now. My tribe, the Choctaw, mostly live in either Mississippi or Oklahoma. My maternal grandmother was Choctaw and I loved my grandmother very much, but lost her at a very early age. When I was young, my mother made our clothes by hand, including (for me) a red, green and yellow grass dance outfit (with flowing yarn along the legs and arms) and after all these years, I still have that precious historic garment. My mom past a few years ago, and I still have her star quilt, her star shawl and even a huge table cloth she crosshayed entirely by hand over many many years. I love being indigenous and yesterday we had a huge powwow at the local college where I teach American Indian Studies. Some 24 years ago I helped start this powwow which became an annual event which has grown and became a major cultural event of this Willamette Valley in Western Oregon. And it made my heart so happy to see so many Native American Baha'is also attending the powwow and we all enjoyed ourselves tremendously. A particularly large number of former and current students of mine, Indian and non-Indian, were also in attendance, which made my heart so happy, ehhhhhhhhhhh? (Only a Native American will understand this expression "EhhhhhhhhhhhhHHHHHH?" For many years I've taught Native American languages and American Indian music in both the Indian community educational programs and activities, and at Lane Community College and the University of Oregon. And Thursday I gave a class on powwow drumming with my powwow drum, and I taught the students 3 powwow songs in Lakota, Cree and Pima (which is now called Tohono O'odham). So let me go back to when I was in the 12th grade, we here call a senior in high school, and I sat with a new friend in our World History course that year. The boy I sat by became my best friend, that was 50 years ago, and we are still in touch. He mentioned "Baha'i" one day, and I told him I was perfectly happy in my Christian Church and that I really wasn't interested in learning anything about his religion. But he handled my closemindedness very well-he'd share thoughts and ideas of the Baha'i teachings in short conversations, there after, any way, only rarely and never did he push it on me. So in time, I began to learn more about Baha'i and what he told me really did begin to interest me. He told me his parents raised him as a Baha'i and yet he seemed to respect Christ and know a lot about the Bible and I was amazed at him, and in time, I just felt compelled to search it out. I decided if I discovered it had been based upon erroneous ideas, I would prove it wrong and think about it no more. I got an introductory book "Prescription for Living" from my friend, John Newport, and I never read it. It didn't seem to be the kind of thing I was used to. So I asked instead if he had a Baha'i book and Biblical evidence to support the Baha'i Faith and he recommended "Thief in the Night"---although he admitted he'd never read it. Well, up till then, I treated what little I knew about Baha'i as quaint, and no more of interest than any other world religion. But when I began reading "Thief in the Night", the most incredible spiritual inspiration began to develop inside my heart. I can still, 50 years later, recall that amazing feeling of awe and amazement each page of that book gave me. Now it was a good book for me to read because if I were to make up a decision about the Baha'i Faith, as either truth or not truth, I really needed to have all my questions answered. And "Thief in the Night" answered all my questions, and many more as well. By the time I completed reading "Thief in the Night" I had become a Baha'i in my heart, and I loved it. I was amazed "Why haven't I heard of this before now?" and John Newport said "You learned about it at the right time you were supposed to." And that made perfect spiritual sense to me. After I learned and totally accepted Baha'u'llah as the Return of Christ, I next had questions about the relationship between Baha'i and Native American religions and cultures. Well, I found Baha'is who were also Native American and they told me that they loved the Baha'i Faith because it totally respected Native religions and indigenous cultures. 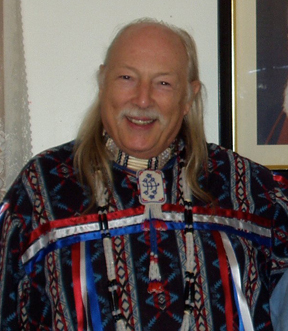 I met Vinson Brown who wrote a lot of books with Native American Baha'is and they explored Native religions, but not revealing anything that they were not supposed to publish. They respected Native ways. I began to look into that and found all kinds of interesting things to read about Native American Baha'is and Baha'i activities on various Indian reservations in not only the USA but all throughout Turtle Island (the Western Hemisphere). I learned some members of the National government bodies or administrative committees of the Baha'i Faith of the USA, Canada, and Alaska were First Nations peoples. They still are in fact. Then a Navajo Baha'i visited Eugene and spoke to the Baha'is and I was utterly thrilled. So at this time, the Newports gave me a Baha'i prayerbook and this began to inspire my soul deeply. Baha'is said if I prayed in a Native American language or used a First Nations prayer, it was just as acceptable to God as it would be a prayer of other religions as well. The Baha'is didn't in any way look down on Indians, and they all accepted the validity of our Native American religions---but the Baha'is weren't trying to patronize Indians. Non Indian Baha'is were not "Shamans" and they weren't saying anything insulting about our religions and cultures. The Baha'i books never treated Indigenous religions or cultures with disrespect in any way. So I just had to become a Baha'i. It just gave me so much joy and incredible feelings of spiritual growth. I just KNEW that Baha'u'llah was the Promised One that we Indigenous peoples were waiting for, as well as the Return of Christ. It all made sense, and I've never, subsequently, discovered anything in the Baha'i Writings offensive or misleading about First Nations and our peoples or languages or beliefs. It made me feel so happy as a Choctaw Indian to find the Baha'i Faith and to realize it respected my right to feel good about being an Indian. Baha'is honor our religions and history and cultures without patronizing them. And most of all, it is very refreshing to see that Baha'is who aren't Indians don't "try" to be Indian. The Baha'is are not a bunch of "Wanabees". (They don't "want-to-be" Indians, which hurts American Indians' feelings.) The Baha'i Writings are a vast ocean of insight AND I've written and published a couple of articles about Indians and the Baha'i Faith. Maybe you'd be interested in them sometime? I hope some of this makes some sense and might bring up some questions if I can help with. Let me know. RAPID CITY, S.D. 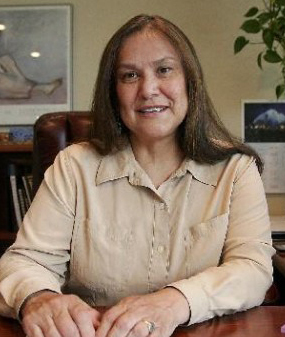 - Jacqueline Left Hand Bull-Delahunt has been chosen as the first American Indian woman to head the National Spiritual Assembly of the Baha'is of the United States. Left Hand Bull-Delahunt, a member of the Rosebud Sioux Tribe, was brought up by traditional Lakota grandparents and parents. She became a member of the Baha'is more than 20 years ago. Left Hand Bull-Delahunt was elected at the annual National Spiritual Assembly gathering in Wilmette, Ill. She had served as vice chairman of the organization, and also served on the National Spiritual Assembly. She traveled the globe meeting with indigenous peoples in South and Central America and in Canada; she also visited the former Soviet Union. She is currently the administrative officer of the Aberdeen Area Tribal Chairman's Health Board in Rapid City. 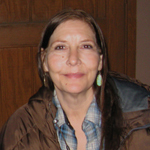 Left Hand Bull-Delahunt worked for the Baha'is at the national center and was appointed to the committee on American Indian teaching, where she was a liaison to the many American Indians who had become Baha'is. When she was introduced to the assembly, she was greeted with a rousing ovation that lasted about 10 minutes. ''Everybody was electrified and it sounded as if they were thrilled. ... I think the significance wasn't so much [for] me personally, but the symbolism of having an America Indian at the head of this assembly,'' she said. Left Hand Bull-Delahunt will preside over at least 18 national meetings throughout the year, and will preside over the assembly as only the third woman to do so. ''I am thrilled to know that when we say we believe in the equality of all people, we promote the equality of women and try to undo all traces of racism,'' she said. She said that throughout indigenous lands, people that are more traditional seem to connect with the Baha'i faith. The similarities between the Baha'i faith and that of traditional cultural teachings is, first, the way women were honored, Left Hand Bull-Delahunt said. ''The writings in the sacred text, I can relate to the Sun Dance songs and the fact that people will say, in our culture, that women are sacred. ''Baha'i faith says that in crisis, women have more natural resources to face the crisis,'' she added. Another similarity between the Baha'i faith and American Indian culture is the regard for Mother Earth. Left Hand Bull-Delahunt will present the point of view of the faith in public meetings. ''We have formal relations with the federal government, as well as the United Nations, and we have a person whose job is to do that. My job would be to talk to the federal government representatives or to the United Nations. I would be part of the group to determine what should be said,'' she said. She will have to meet with the members of the National Spiritual Assembly, who she said are very intelligent and have very strong views, to consult and to come to a unified view. A meeting agenda is also put together by the chairman. ''We try to apply those principles from our text to world situations or situations in any of our communities. We spend a lot of time with our youth working in efforts to engage them,'' she said.